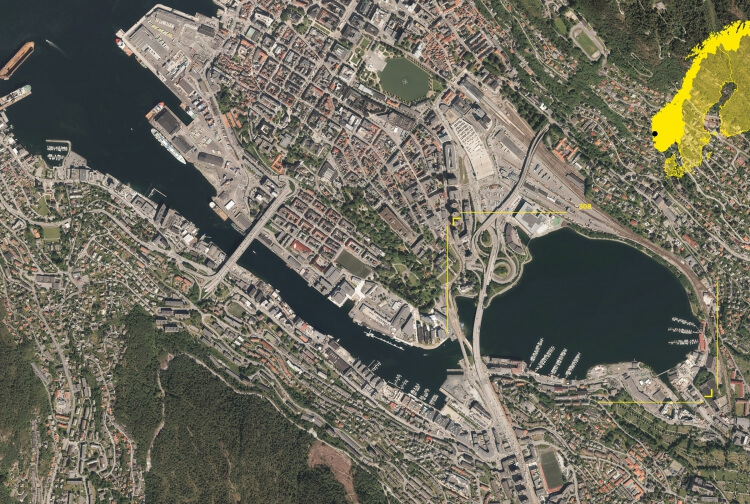 In January 2004, 3RW Architects and S333 Architecture + Urbanism won the international competition organised by the City of Bergen for the redevelopment of Store Lungegardsvann, an area of roughly 20 hectares close to the city centre of Bergen. Bergen has since the 1960’s on prioritized the location of large parts of the different programs (living, working, shopping etc.) to the outskirts of the municipality, and by that created so-called extremities; one place, one function. Therefore, these places appear as sheer tools: you buy plants at Lagunen and sofa in Åsane; you work at Kokstad and live in Minde; you play tennis in Paradis. Such an organization – such an outsourcing – has its clear advantages, but there is at least one clear hurdle: by placing large parts of the city’s core activities in the peripheries, the city itself becomes peripheral. But the way many companies now wish to bring back formerly vulnerable services, we now see the contours of a new movement, an insourcing: It is about bringing back services and functions. With this as a precondition and basic attitude, the challenge of the task becomes the following: what kind of approach should be the foundation of an injection of a regional and communal program around Store Lungegårdsvann? From the beginning of the 20th century a partial downgrading of Alrekstadvågen/Lungegårdsvannene took place. Around mid-century, that which was the inner-city harbor (Lille Lungegårdsvann) was cut off from Store Lungegårdsvann. New land has since been created to meet new infrastructural demands. After a period of factories and industrial activities the area has now been dedicated to the large scale and modern times’ contact network. Such scale requires collectivity, it requires a complex society. The basic need of a dedicated scale that can manage collectivity is significant for Bergen’s appearance. We see it through the compact middle-age town’s development of the commons, we see it through national romanticism’s modification of the city’s hill-sides, and we see it in the priority that public space is given in the valuation of the city. With that, one may claim that Bergen has a very good base. A good base for the organization of collective programs. It can be claimed that such a collectivity cannot be planned through the planning of the individual elements, but only through planning some strategies, images. Such images add to a place a dream, and by that a significance – an integrity. The images must draw faces. In the area around Store Lungegårdsvann, one needs to draw faces referring to a large scale, town districts, regions and different worlds. Such images are in themselves collective projects, they are not collections of buildings. They are landscapes; they are rivers, lakes, mountains, islands. They are names; they are The Peak, The Islet, The Cove. They are terms; they are a town square, a boulevard, a path and a stadium. They are the prerequisites and the bases of an injection of a collective program. Each of the built element refers to a such collective scale, and become thereby responsible in relation to it. In the search of new positions, outside of the shadows of the absent meanings, the city has to obtain and cultivate the composite life. Each of the built elements must therefore participate in the image of such a collectivity. They become responsible for such a collectivity. They become responsible for making the city and its spaces good places to live, relax and work in. While Bergen has built houses for the last 40 years, there now has to be built a society. A society with integrity, a society with a new self-image. To achieve this one begins with the images.